If you are interested in volunteering to help with a JD Theatrical production, we do accept limited volunteers and student internships. For more information email our office with your information. Exit Fairview and go north (away from the beach) 1.2 miles to Segerstrom and turn left (west). Enter the second driveway on your right. 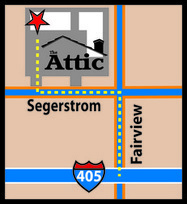 The Attic faces Segerstrom even though we have a Fairview address.